218 pages | 6 B/W Illus. The book looks at the corporate management system and how it affects company performance. The main theme revolves around the notion that when a company values its workers and their satisfaction, that company can achieve success. 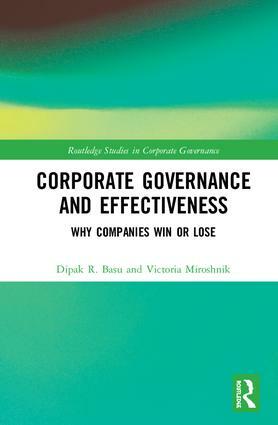 The book is unique in its quantitative perspective and analysis and examines whether a corporate management system can be regarded as a source of a firm's competitive advantage by creating a sustainable competitive advantage and firm performance. The book examines how, in the context of Japanese multinational corporations (MNCs), corporate management can be part of an MNC's strategy in enhancing its capabilities, both in the home and abroad, in Japan and in Thailand. Also, it analyses the reason for the demise of two major Indian companies, Dunlop and Hindustan Motors in terms of their unsympathetic management systems. 'Japanese management technique is normally ignored in the West but it is related to a critical analysis of Karl Marx presented in the 19th century. The main thesis is that if the managers do not consult the workers and do not recognize their human dignity, the workers get alienated and cannot perform. In the film Modern Times of Charlie Chapin, that problem was described in a funny way. In the Japanese management system, this issue was taken very seriously and one of the criteria of corporate efficiency is the satisfaction of the workers. This book has taken the task of the analysis of the Japanese management system and their success in the major Japanese automobile companies in terms of close relationship between the person and the organization in that management system. Dipak R. Basu is Emeritus Professor at the Faculty of Economics, Nagasaki University, Japan. Victoria Miroshnik is Professor of Management at Reitaku University, Japan. Corporate Governance can be defined as the system of policies, practices, actions and processes by which an organization is lead and managed. Corporate Governance theory examines balancing the interests of the many stakeholders within an organization and the societies in which it operates. This series looks at different systems of Corporate Governance as well examining stakeholder perspectives, including shareholders, management, leadership, customers, suppliers and financiers, encompassing practically every sphere of management. This series publishes cutting edge and definitive coverage of all key topics in Corporate Governance and related interdisciplinary areas including but not limited to; Management Strategy; Leadership; International Business and Economics; Organizational Behavior; Business Ethics; Entrepreneurship; Accounting and Finance.